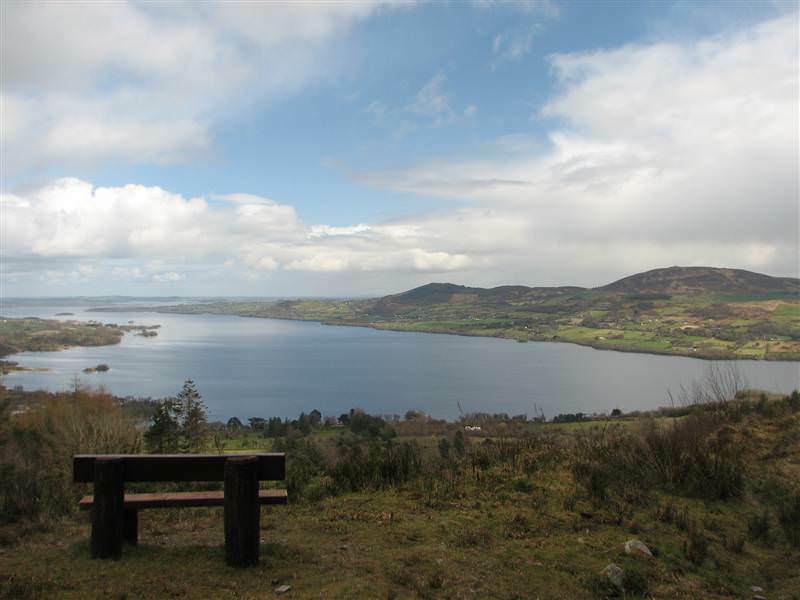 This Loop Walk is located in the townland of Ballycuggaran, the homeland of the O’Cuggarans, an important family at the court of Brian Boru.Ballycuggaran Loop Walk is overlooking Lough Derg, the Annacarriga valley and the hills that stretch from Caherhurley to Ogonnelloe. This loop walk is part of the network of Shannon Region Loop Walks and is marked using the standard red Shannon Region Trails directional arrows. The loop walk is marked in both directions. Start from the village of Killaloe which is on the R463 from Limerick City and continue on the R463 in the direction of Ogonnelloe and Scarriff. After approximately 4km the trailhead is located on your right at Rinnaman Point (Two-mile Gate). This is a very spacious and popular lakeside public amenity area on the shores of Lough Derg. The trailhead and car park are located near the University of Limerick watersports and adventure centre and is signposted from Killaloe. A-B. Starting from the mapboard in the car park turn right on the R463 towards Ogonnelloe/Scarriff. After approximately 100m turn left on to a minor road following the red Shannon Region Trails arrows. You are also on the East Clare Way (marked with yellow arrows and the familiar trekking man logo). Follow this minor road for approximately 2km until you meet a track heading uphill to the left. B-C. Travel this forestry path for approximately 800m until you emerge on the Coillte developed forestry road. C-D. Turning left on this road on Feenlea Mountain. Travel down the mountain overlooking the beautiful Lough Derg. This area is known as Crag Wood. The once great Oak woods have long gone and now Sitka Spruce, Norway Spruce, Japanese Lurch and Noble Fir stand in it’s place. Make your way following the winding paths towards the R463. D-E. At this juntion, turn left and cross the road making your short trip back to the start of this route.